NASA's Cassini spacecraft captured this image of Saturn's shadow covering part the planet's rings on Feb. 3, 2017. Saturn's shadow takes a bite out of the planet's iconic rings in a stunning new photo by NASA's Cassini spacecraft. 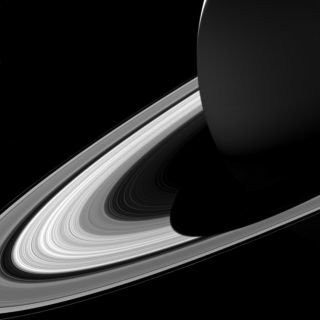 The gas giant's shadow has been shrinking since August 2009, when spring came to Saturn's northern hemisphere, and will continue to do so until summer arrives there on May 24, NASA officials said. Saturn's rotational axis is tilted relative to the sun, so the ringed planet has seasons, just like Earth does. Saturn seasons each last more than seven Earth years, because it takes the ringed planet more than 29 years to make one lap around the sun. Cassini captured the newly released photo on Feb. 3, when the probe was about 760,000 miles (1.2 million kilometers) from Saturn, and about 10 degrees above the ring plane, they added. Cassini has been studying Saturn, its rings and many moons up close for nearly 13 years, but that groundbreaking work is nearly done. The probe is now in the "Grand Finale" phase of its mission, which consists of 22 dives through the gap between Saturn's cloud tops and its innermost rings. The fourth of these dives, in fact, occurs today. Cassini's $3.2 billion mission — a joint effort of NASA, the European Space Agency and the Italian Space Agency — will come to an end on Sept. 15 with an intentional death dive into Saturn's thick atmosphere. This maneuver is intended to ensure that the probe doesn't contaminate Titan or Enceladus, two Saturn moons that might be capable of supporting life, with microbes from Earth, NASA officials have said.